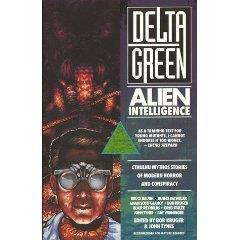 Delta Green: Alien Intelligence is a set of eight short stories set in the world of the Cthulhu Mythos of H.P. Lovecraft. Beyond being modern updates of the pulp horror of the 1930s, these stories seamlessly intertwine the Cthulhu Mythos into modern day conspiracy theory and the myths of alien abduction and visitation.